So, I'm turning 30 in a little over two weeks. TWO WEEKS (and change). Oh, what a world. With gray hairs sprouting, fine lines developing and a bun in the oven, I'm approaching the milestone year with a relative amount of acceptance, if not unaccountable bewilderment. You go through life feeling like you'll never get old, that somehow an exemption will be made in your case. Not so. Though, like my godmother said, aging beats the alternative. I'm not sure what the plans are. The Dude said he would sort something out, so I'm leaving it to him. So strange to have named my blog after this pending birthday and now it's approaching at an inhuman speed. One thing I realize I forgot to include back at Halloween was a picture of my costume! This is an old costume from 2009 that somehow still fits thanks to the powers of spandex. The Dude threw on his Super Grover costume and we sat out on the porch and handed out candy. Or at least we tried. We actually got snubbed by a lot of families! Heck. I mean, it's free candy. 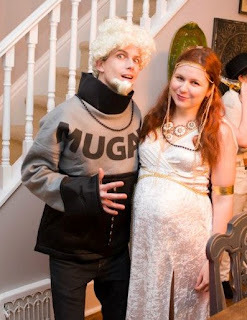 Greek goddess, and yes, the Dude is Mugatu and loving it. 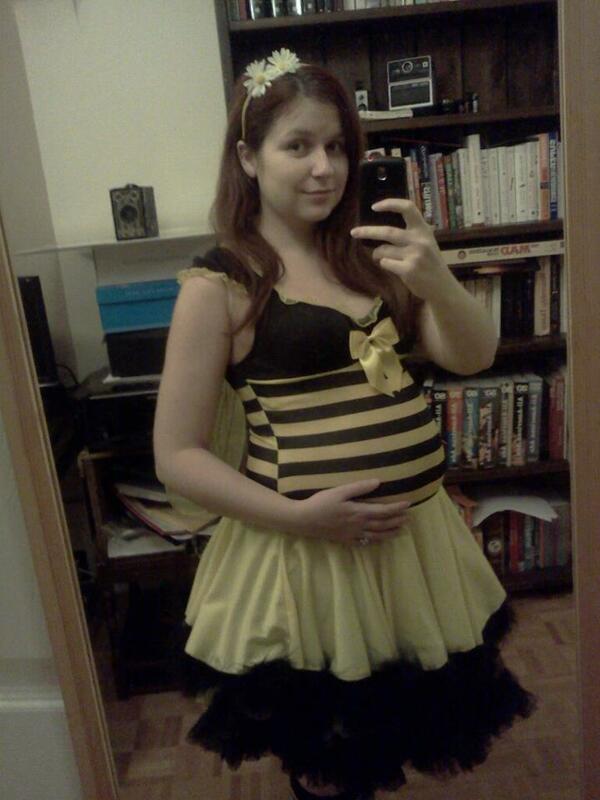 Now, when you're pregnant, no matter what you dress up as, it's going to be seen as a pregnant something or other. There's really no escaping it without being a pumpkin. Pregnant nun. Pregnant witch. Pregnant Cookie Monster. So, you roll with it, and thus what was I the goddess of? Fertility. The party was, as always, a great time and had a record turnout. It's really awesome to be out and about, enjoying my friends. Time is really ticking for me on the hang out freedom front and it's important not to take this time for granted. The Dude started painting the nursery and we've ordered the crib. Inch by inch I'm growing and piece by piece we're putting together our new lives.